This is one Liter, 34.0 oz, Martinis Kalamata Extra Virgin Olive Oil + 2 jars of Martinis Green Olives. *Note: New packaging - picture does not reflect this yet! 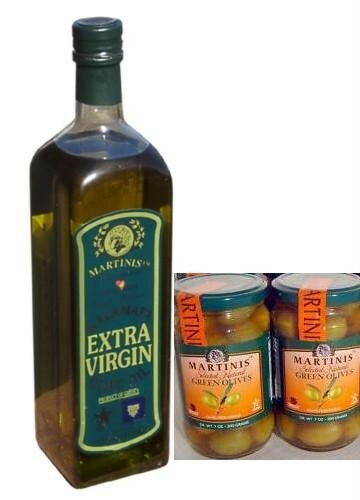 Martinis is a classic, top quality 100% Greek Extra Virgin Olive Oil. with a nice subtle after taste. First Cold Pressed, Super low acidity 0 - 0.6%. Martinis estate grown Premium Extra Virgin Olive Oil is 100% Natural, made from fully sun-ripened, handpicked olives from Kalamata region. This oil is not blended with oils from other areas.